I know these guys..it was taken Whitby Goth weekend April this year.. it was warm but not hot! and yes ghostbusters logo..cos well steampunk ghostbuster of course! That's not Whitby - that's George Street in Hastings Old Town. 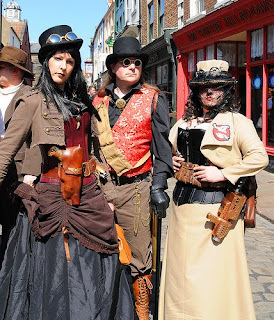 lol..well either they're dopplegangers or you are wrong DavidP as i was with those steampunks and i can assure you it IS Whitby - Old town, just down from Justins the chocolatiers. thats the road that leads upto the many many many steps to the Abbey. i do know the road you refer to in Hastings and it has simiarities.